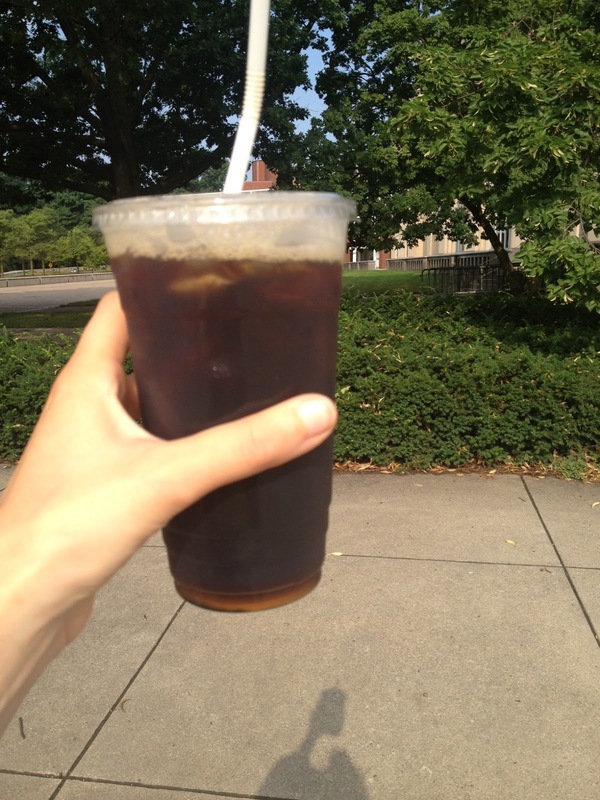 I’m jumping on yet another blog-related bandwagon and participating in my first ever What I Ate Wednesday! Started by Jenn over at Peas & Crayons, WIAW is a great little snapshot of a days worth of eats. I’ve always loved seeing what other bloggers consume on a typical (or sometimes not-so-typical) day and I figured I would join in on the fun! *DISCLAIMER* I didn’t photograph everything I ate because as a rookie WIAW-er I just didn’t remember. I started the day off with a bit of a snag. 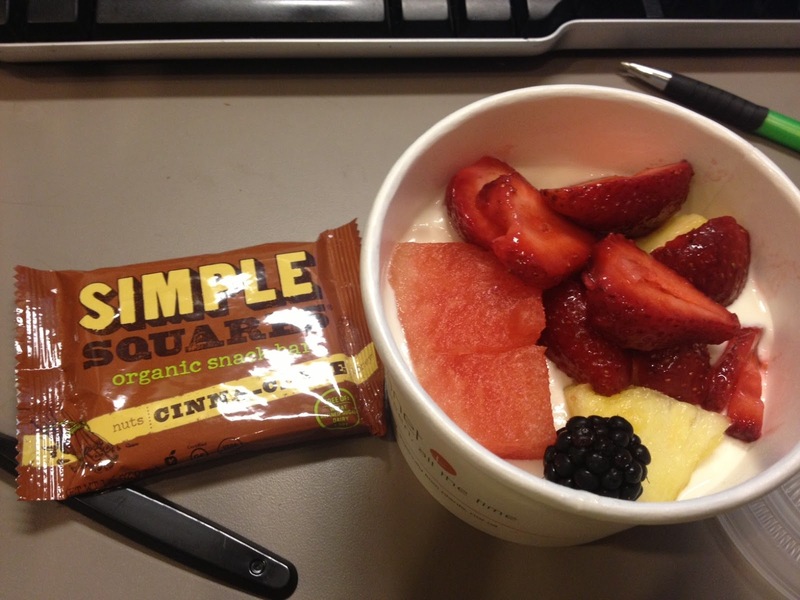 I was all set to crumble a quinoa bar into my yogurt for an at-my-desk breakfast but I quickly discovered that I had forgot said quinoa bar at home! Luckily our cafe at work is well-stocked with healthy options. 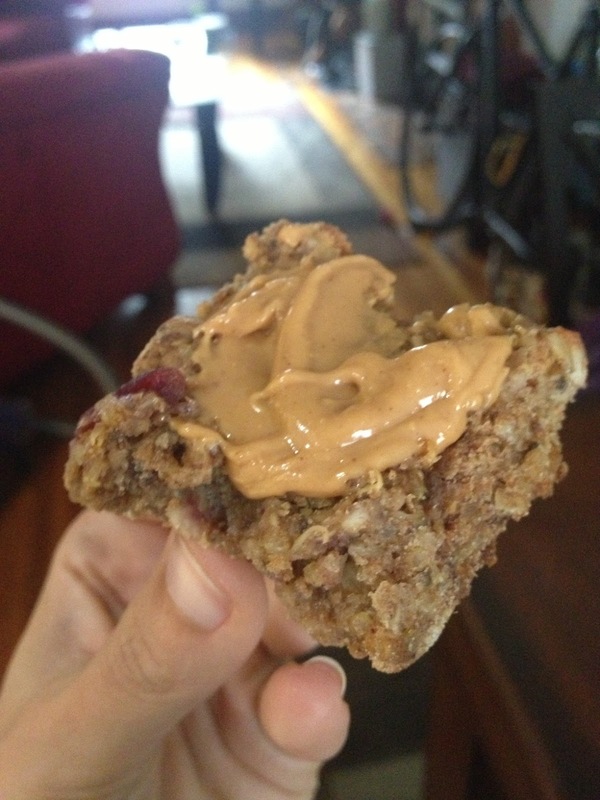 You know what else happened to be at home with my quinoa bar? My lunch. I was definitely not on top of my game. I was crunched for time and wanted to find a fast, affordable and at least remotely healthy lunch option. Enter Jimmy Johns. Not my photo, borrowed from the internets. But it looked just like this! 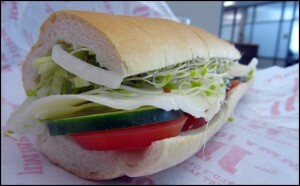 I got the #6 vegetarian sub (provolone, sprouts, lettuce, cucumbers, tomato + avocado) w/ no mayo and added hot peppers. At under 500 calories and a whopping 25 grams of protein I felt okay about my choice. It’s not something I indulge in often and there are far worse options around my work. I also liked that I could look up the nutritional information of all their items. I was reunited with Jillian and it hurt so good! After taking nearly 2 weeks I was feeling it just minutes into the workout. For anyone familiar with NMTZ those surrenders will be the death of me! Besides the fact that she doesn’t let you put your arms down (and I was using my big girl 5lb weights) I always end up with bruises on my knees. But I’m proud to say I survived. Throughout the DVD my workout partner kept talking about Chipotle and I was SO tempted to go with her when we finished. But since 1. I had ate out for lunch and 2. I knew I had pretty much all the ingredients for homemade Chipotle, I resisted. 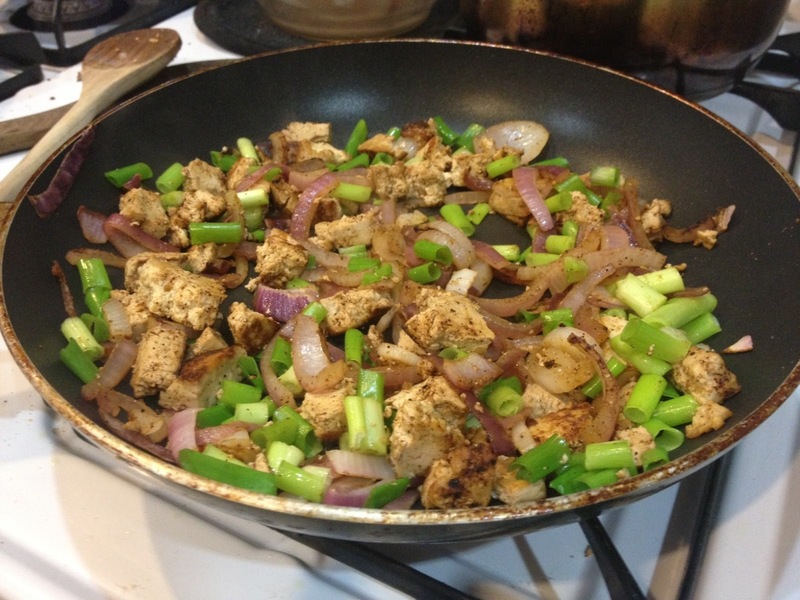 In the pan: red onion, crumbled tofu, green onions, cumin + chili powder. 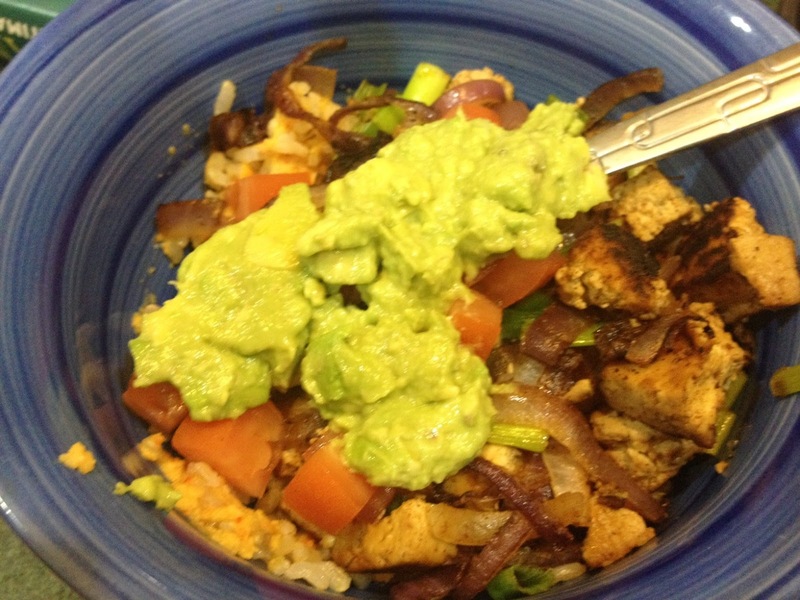 In the bowl: TJ’s pre-cooked brown rice mixed with homemade spicy red pepper hummus, tofu/onion mixture, raw tomato and a lime-avocado puree. The last time I forgot my lunch at home and had to go to the cafeteria, I ended up with a veggie burger… the bun and burger both fried in butter. Now I make sure to always keep snacks in my office!